Now it’s time for the Chalmers Championships in mil! Here you will run a scandinavian mile(10 km) and test yourself against other participants. The three best from womens and mens class respectively will receive a medal. The race will take place on may the 11th between 13:00 and 16:00 and will be at the skatås Motionscentrum. You will also receive a scarf, a sports drink before the race and a kexchoklad(candybar) at the finish line. We in frITid of course want as many as possible to participate so we are ready to pay for the participation fee for a given number of players. First come first served so don’t hesitate to apply if you want to participate. Last application date is the 1st of may. Though it is only in swedish so feel free to contact and ask us questions if there is something you don’t understand. Are you interested in computer games and arranging your own LANs? Join LaggIT!! We now have our aspiration period and annual meeting where you have the opportunity of joining the next LaggIT board. Save the dates below and we'll see you then! Continuous information will be given in the slack channel #laggit-asp and at Facebook. Meeting documents will be sent via email to our members. Become a member here. On may 14th it's the kick-off for CM in fotball, IT is of course going to have a team. To participate register in the form below before the 7/5, but register as fast as you can since it's first come first served. The student division meeting will be held in HA1 6:15PM on May 15. We give out food before the meeting for members of the student division that have sign up on this link. If you want to write a motion you have to send it to styrIT (styrit@chalmers.it) at least seven lecture days before the meeting. Now this wednesday the time has come for winevolley! Winevolley is a old aspiration tradition in many other student division and it has now become time for frITid to test out this favorit! The event is, as the name suggests, an evening with volleyball and wine. The rules are simple, but not to spoil the surprise we will hold on these for later. If you don’t like wine it is completely fine to bring any other beverage. It will take place at the excersice hall in the Chalmers union building and will be held between 20:15 and 23:00 wednesday next week (17/04). There is no form so you can just show up and have fun! It is BYOB but judging from the rumors there might be homebrewed wine to taste. It will be fun but, above all, fun! 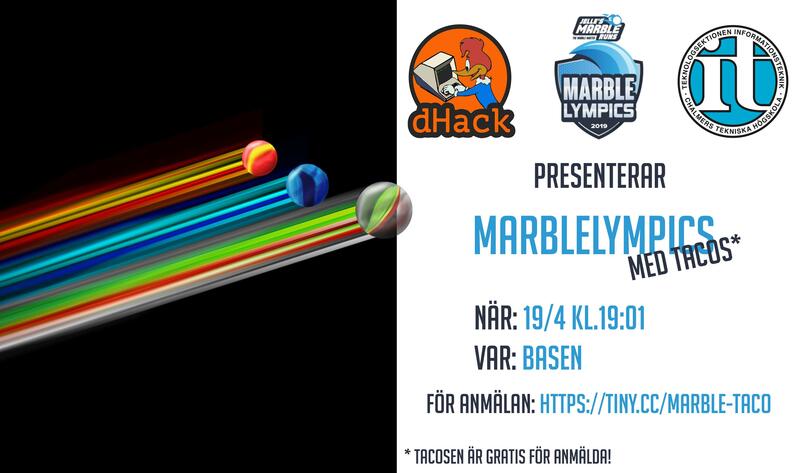 We meet, eat tacos and watch Marblelympics 2019! The event (and food) is free for all signed up participants. On tuesday 16th of April PritonZ (P.R.I.T. & DaltonZ) will arrange DaltIT. Great company, fun games and awesome food (Hamburgers and Waffles) will make DaltIT an event you don't want to miss. If you want to go you'll have to fill in the form. Then just grab your drink (BYOB) and some money for food, and join us in Sandlådan (Between M and EDIT) at 18.06! Hello everyone who is finishing their bachelor in IT! You can now sign up for the Bachelor dinner. Do note that you can only attend the dinner one time as a bachelor. We meet up 18:01 at Linneplatsen from which we walk together to the dinner. More information will come via mail. Tomorrow at 17:00 we will host our first game evening for the study period in Hubben 2.1. If you are excited to play board games or just want to take a well earned rest from studying, just come by! In addition to a wide selection of board games, we will sell snacks and good food later in the evening. We will be hosting more game evenings and a game day later in the study period. The 10/4 17.00 in EG-3217 FikIT will be hosting this year's annual meeting for all its members. Come, eat some fika and get elected for / elect next year's board! Does your LaTeX skills fail you when you need them the most? Then this lecture + workshop is for you! Do you want to sit in IT's most important association or are you just a person who likes fika? 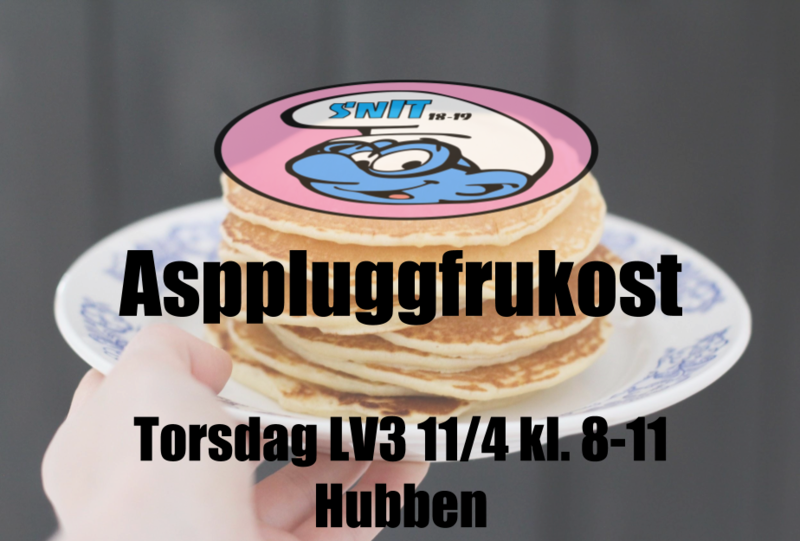 Come to FikIT-aspning on Tuesday! We will be in Grupprummet in Hubben and bake some chocolate balls, listen to good music and of course EAT FIKA! Tuesday 2/4 17:30 in Grupprummet in Hubben, everyone is welcome! Monday the 1 of April Ericsson will come visit campus and invites you to join them in Basen for some food and drinks and a chance to mingle with representatives from Ericsson. Ericsson is currently hiring for the positions listed below and the hiring managers will be present during the evening to answer you questions and tell you more about the different positions. Tonight is finally the start of StyrITs and SnITs application processes, there will be an information event where you can learn more about the work of the committe as well as individual posts. There will also be cookies. Have you not yet decided what course to take this fall or what masters program to choose? Are you currently enrolled in a masters program you think others would enjoy? Have you taken a course that you would recommend? Then come to snIT's Masters- & Course choice mingle and share with and/or learn from your fellow students!